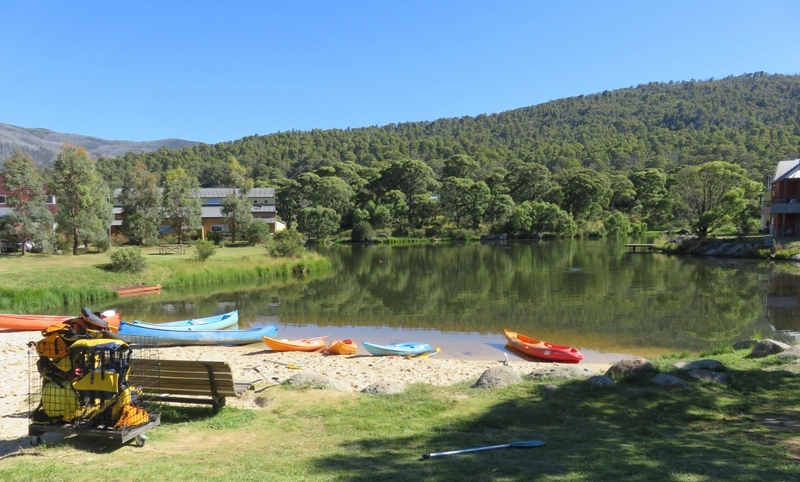 Lake Crackenback, kangaroos, canoes and cool air..
Canberra is just a short drive away from the Snowy Mountains… the highest alpine wilderness in Australia. 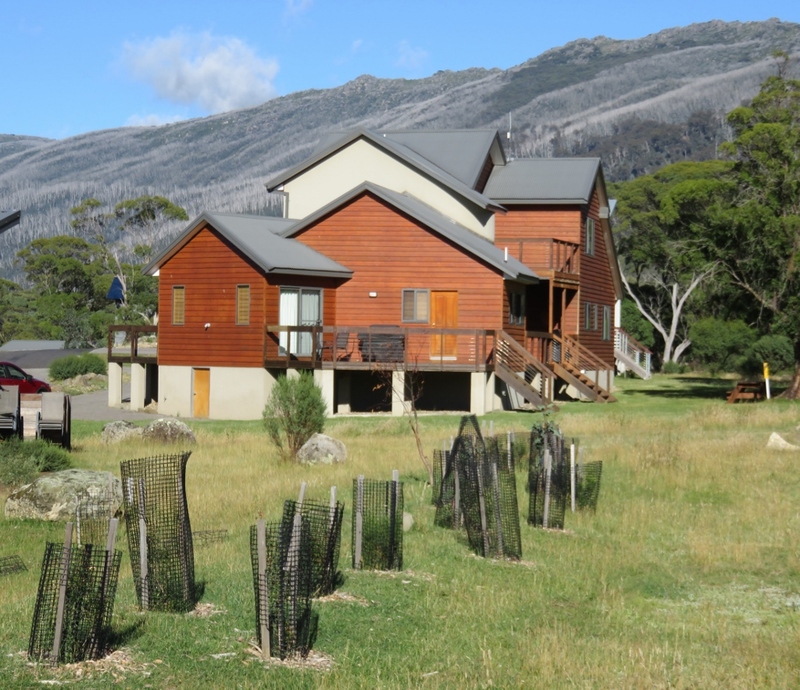 The Lake Crackenback Resort, near Australia’s highest mountain, Mount Kosciuszko, is the perfect cool summer place for us to celebrate our 39th wedding anniversary….where did the time go? 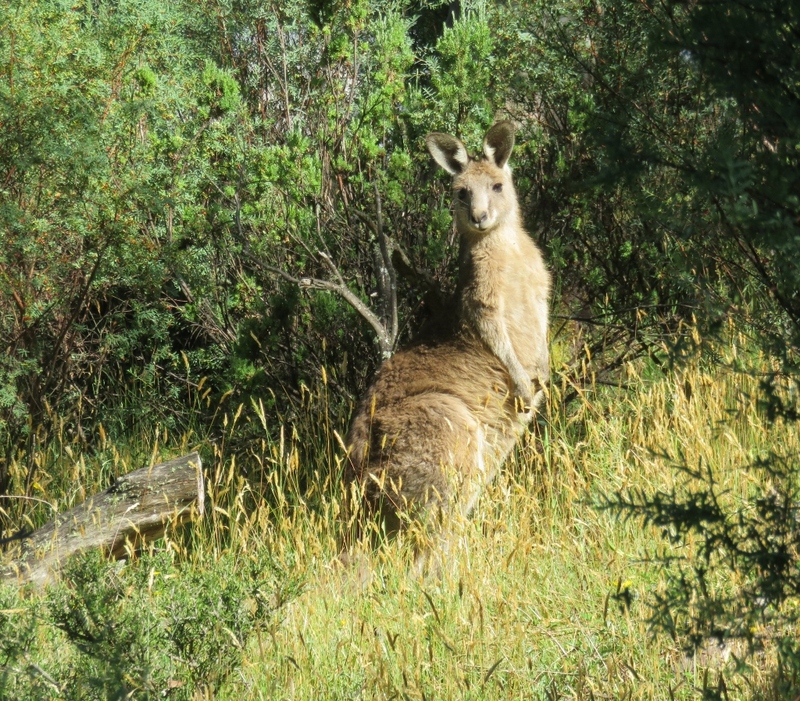 On our early morning walk we saw this beguiling little kangaroo….she waited patiently while we took about five photos. Can you believe that pose? Phew, she’s hopped down to join her family. Off to shoot the breeze on the golf course..
Australia is the driest continent on earth, and since the 19th century with expanding settlement and farming, there has been a critical need for irrigation, and a water supply to combat droughts. The Snowy Mountains, with melting snow and flowing rivers, was ideal for hydro-electricity. 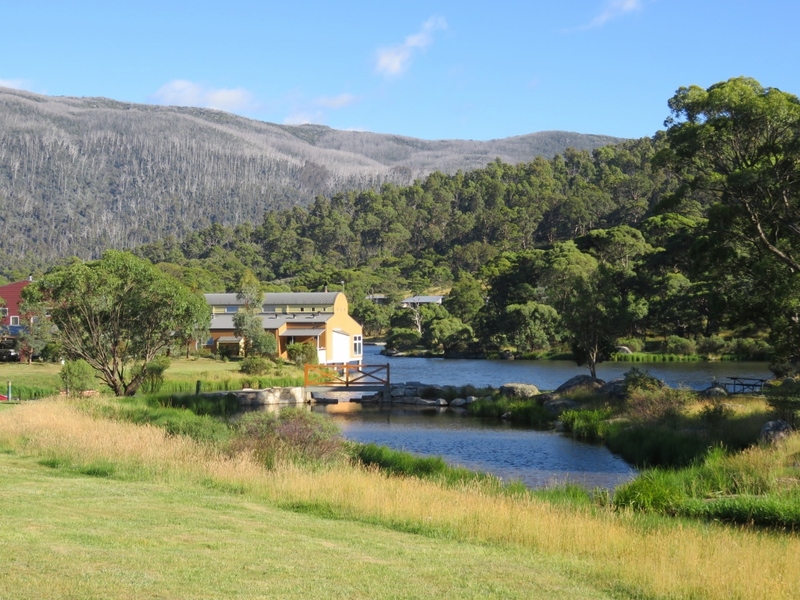 Thus began, in 1949 one of the biggest post WW11 projects, the Snowy Mountains Scheme. This scheme changed the course of Australian history in many ways, and definitely deserves its own post, later this year. In the meanwhile, I’m passing on the canoeing (easy for some)….. but we are ready to try out the excellent pizzas in the Alpine Larder. 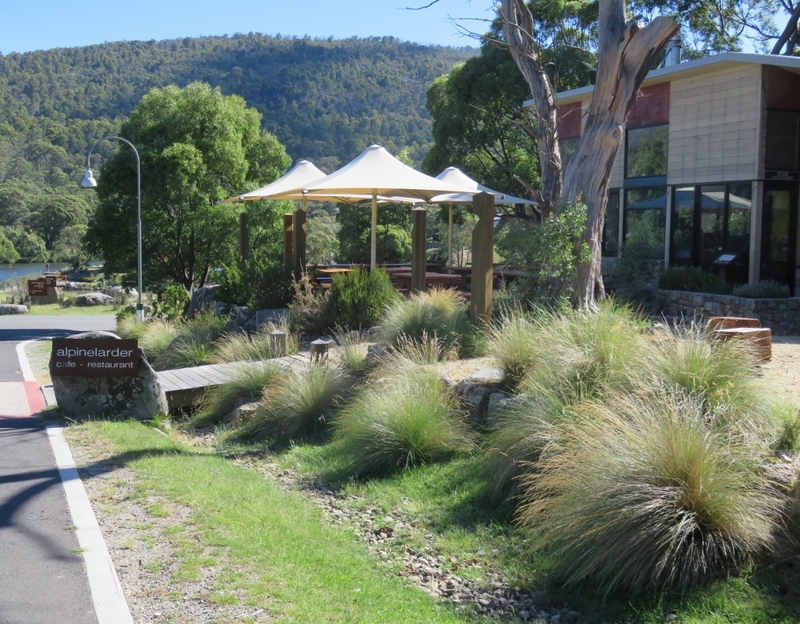 Look at the wonderful soft grasses! I was brought up in Africa, running through grasses trying not to attract snakes and bugs, so I’m a latecomer to how beautiful they look in a landscape like this. 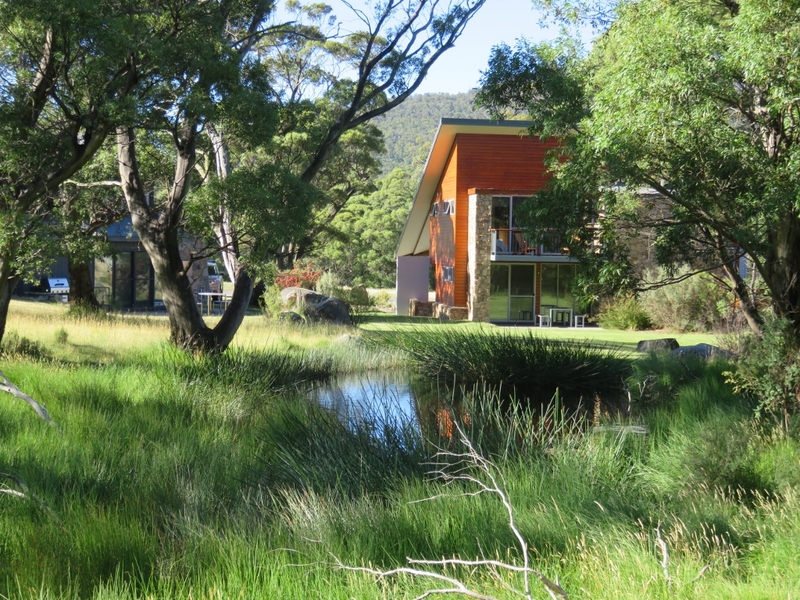 There are fences and gates between the kangaroos and houses, but …. I bet it is hard to keep all the animals and insects away from new plants..
But…. we are happy just to be here. So, a toast to our 39th Wedding anniversary, and to having the good fortune to be able to stay in the lovely Snowy Mountains. …and looking out over this most precious and elusive resource in Australia…water. 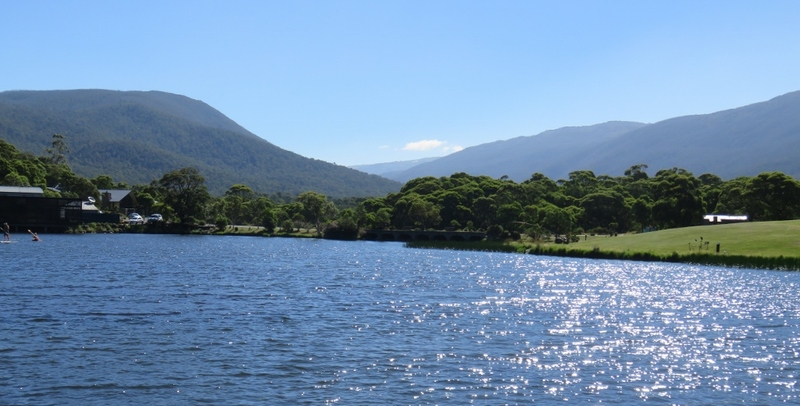 This entry was posted in Lake Crackenback and tagged Canberra, hydroelectricity, joey, kangaroos, Lake Crackenback, Mt Kosciuszko, rivers, snow, Snowy Mountain scheme, Snowy Mountains, water, wedding anniversary on January 27, 2017 by germac4. What a beautiful place. Happy Anniversary! Oh, I can just breathe in that peaceful air. Talk about “mirror water” – just like a dream postcard. Thanks … Yes the air was so clear & fresh .. We felt very healthy! What a wonderful place to spend time. I remember driving through those mountains in 1958, I think they were still working on the scheme in those days. I look forward to the day when you do a post about the scheme. It would have been a tough place to live & work in those days … The houses were not built for the climate! Thanks Judy…..yes it was a great place to celebrate. Happy anniversary! You certainly found a wonderful place to celebrate the special occasion. Love your backlit “young star” among illuminated grasses. Beautiful! 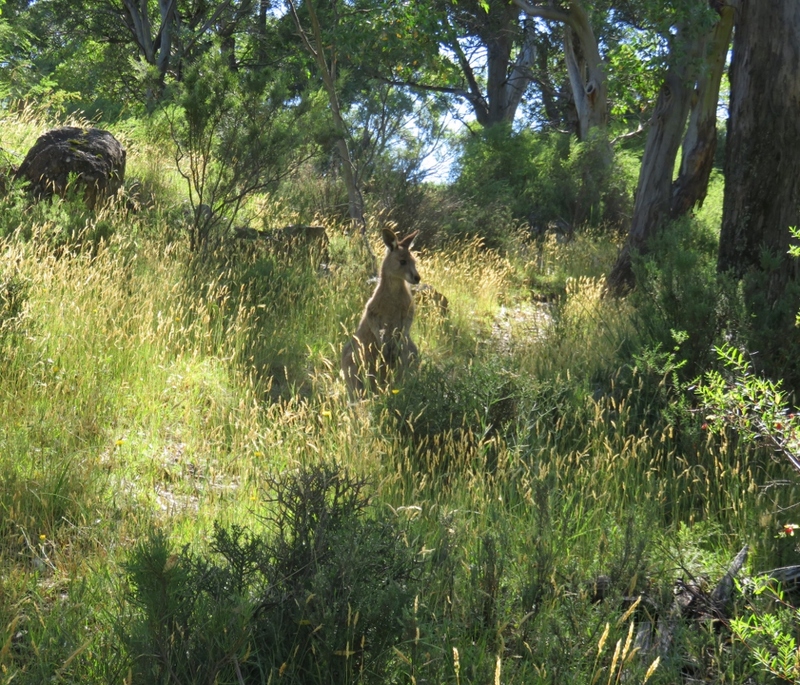 Thanks Marian…… there were a few photo opportunities with the lovely grasses and the posing Kangaroo! Oh those kangaroos! You realise I’m going to be doubly, triply, quadruply envious when I read your posts now, having experienced just a little of the landscape first hand. Thanks Jessica, well I”m glad you came…there don’t seem to be many blogs featuring Aussie landscapes, so I’ll look forward to yours…and you can always come again! Happy anniversary Gerrie. What a delightful place, somewhere else that I’ve added to my list to visit on the big island! That kangaroo is a real star, love your commentary 🙂 Definitely a teenager. Thanks Ruth, yes, I think we can all identify with that ”teenager with attitude”! 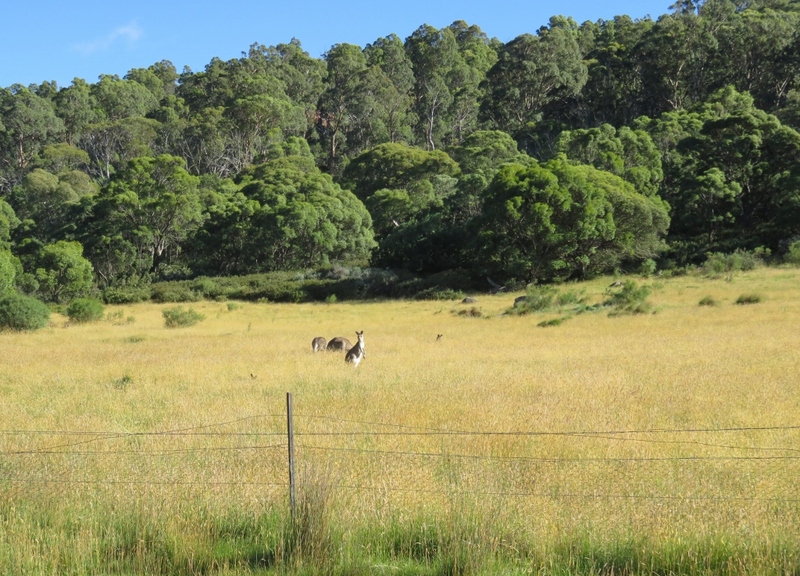 Thanks Sarah, and yes, the kangaroos are loving all the fresh green vegetation! Congratulations on 39 years! We’re only at 32. 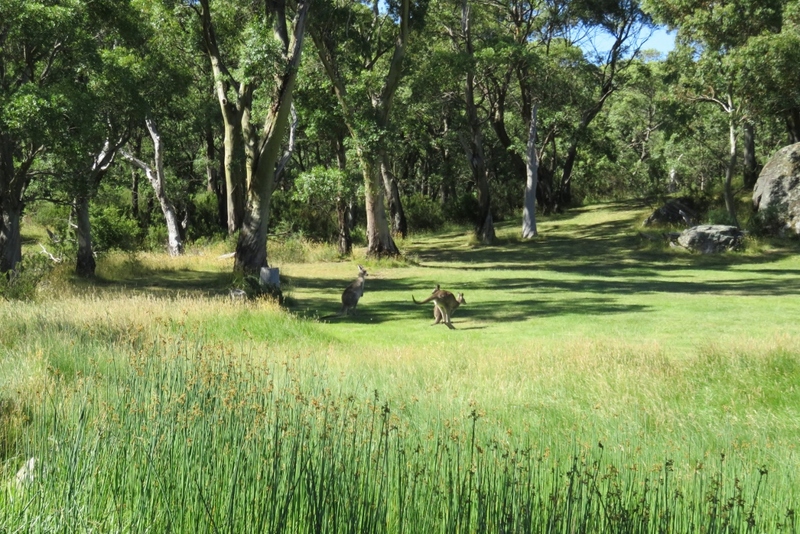 Looks like a wonderful spot – love the photos of the kangaroos. Congratulations on 32 years… All an achievement in this crazy world. Re kangaroos I think the Audrey Hepburn of the kangaroo world won the show. Way to go guys on your 39th! Yes, obviously you are doing many things right. I raise a glass for you both! 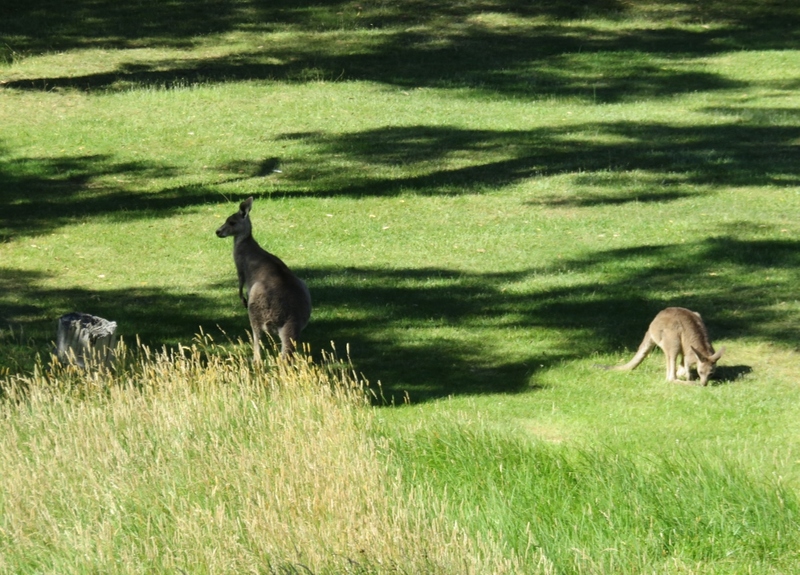 Loved the Snowy mountains, and as for the kangaroos…. simply lovely! Especially that stroppy teenager. I thought you’d like the teenager…. Animals are just loaded with personality aren’t they? Well your Dad passed on some useful skills, I never could understand any Afrikaans.. hope you got some photos of his time. My Mum lived in Cape Town for many years but my brothers & I were born & brought up in Zambia. I must do a post on that time but don’t have great photos. I was a child, when learning Afrikaans, it was all about the clicks in the roof of the mouth, I would be incapable of mastering it now. Will do once I’ve found my photos! 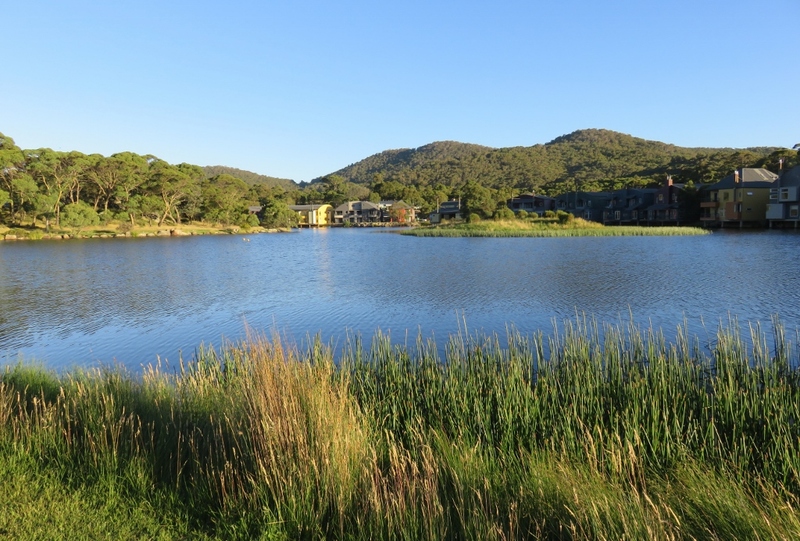 Lovely to see a lake filled with water, after looking at daunting pictures of our emptying dams. Yes, I think I read on your blog, down to 40% water in the dams? Terrible! By the way Diana, do you follow the blog called Janna Schreier Garden Design? She has a great post called Kirstenbosch Botanical Garden, Cape Town. 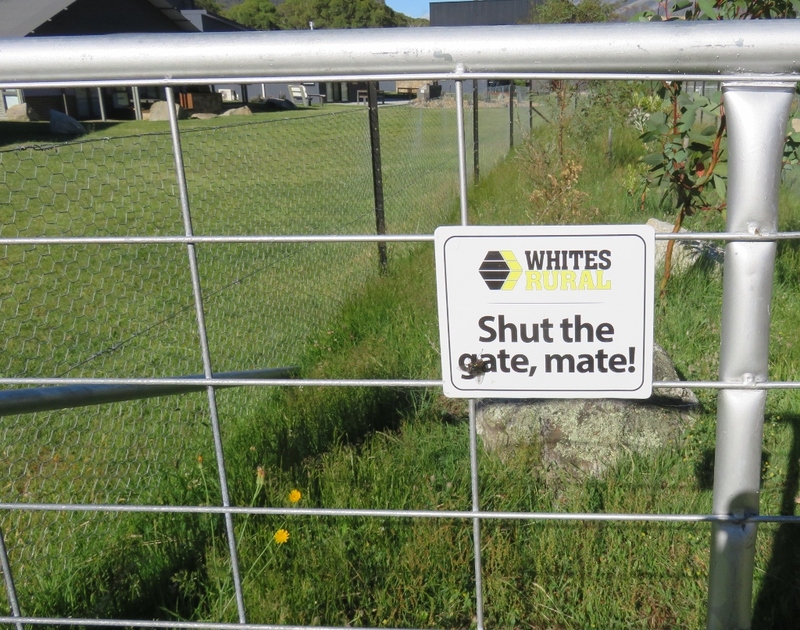 Thanks Sylvia, yes the ”shut the gate mate!” is such an Aussie way of putting it!